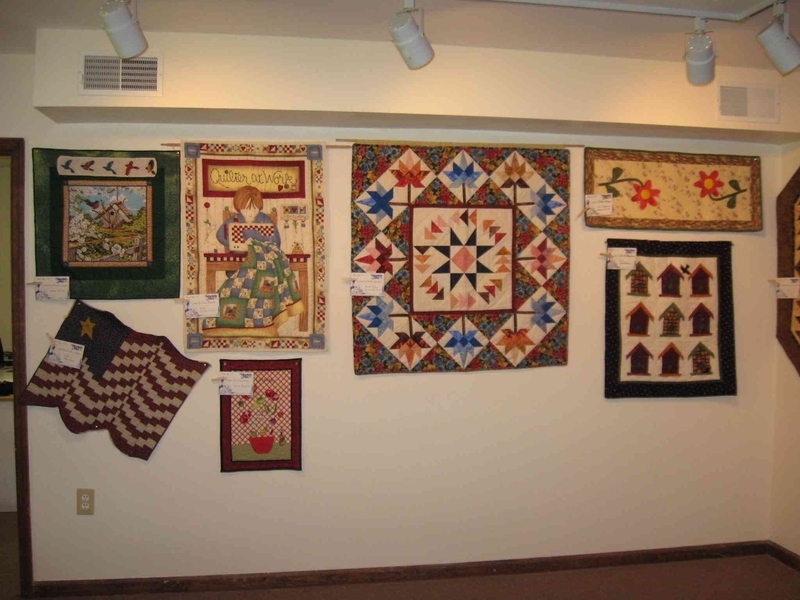 Whether you have a family heirloom quilt or a personalized wall hanging you want to display, hanging a quilt adds a touch of cozy decor to your home while showing off the beauty and craftsmanship of the quilt itself. Instead of nailing the quilt to the wall and damaging the fabric, you can easily adapt a quilt to add a hanger for display. Lay the quilt on your work space, face down. Fold the top of the quilt down 2 or 2 1/2 inches. Pin the fold in place. This is the loop for your wooden dowel, which you should cut to 1/2 inch or 1 inch shorter than the width of the quilt. Sew the loop in place with a needle and thread. Sew one end of the loop closed, leaving the other side open. Slide the dowel into the pocket. Sew the open end of the loop closed to seal the dowel inside. This will hold the dowel in place and keep the top of the quilt from sagging while on the wall. Pin the end of the ribbon to one side of the top of the quilt where the dowel is sewn in. Unspool the ribbon and cut it 1 or 2 inches past the opposite edge of the quilt. Turn the ribbon end over so there is a fold in it. This will allow it to hang on the screw or nail with the ribbon against the wall. Pin the loose end of the ribbon to the edge of the quilt so the ribbon is across the top. Keep the fold in the ribbon. There should be a little slack in the ribbon, which will allow it to hang. If you want the ribbon to hang higher on the quilt, take it further past the side.Sew the ends of the ribbon to the quilt where you pinned them. This is the hanger for your quilt. Use a stud finder to find a beam running vertically in the wall. This will help anchor the screw or nail in the wall to keep the quilt from falling. Mark the stud with a pencil. Use the drill or hammer to put the screw or nail into the wall where you marked the stud. Be sure it is in far enough to keep from coming loose. Hang the quilt on the nail or screw by the ribbon hanger. Adjust the sides until it hangs straight. If desired, use a level to make sure the dowel is not crooked.